This is a great plan for debt-free and low income housing. It’s a practical design for the third world, and those of us in the first world without first world money. My only change would be secure shutters to close over the windows for safety. Thank you for donating your time to providing all the free plans, and the innumerable tutorials on youtube and the like. After hearing Vijay Govindarajan’s video, I think this whole open design challenge of an affordable home is a noble goal. VG discusses using capitalism and mass production to meet the 5 billion in need of adequate housing. The idea of this seems great, though in practice I can see problems. In areas of poverty and developing nations, even $300 is a lot and that money leaving the region/country to a large corporation or bank seems somewhat unethical, when paying/bartering for local resources would strengthen their local economy. 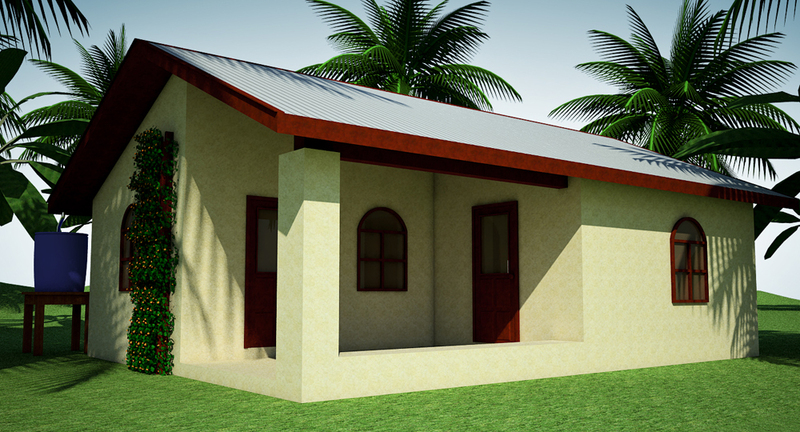 Especially if the way this project manifested itself did not involve educating the local people on building their own housing. When you factor in that anything mass produced will be made in a central location, will likely be heavy and the cost of shipping, meeting the $300 mark seems unlikely. Shipping by barge or plane to meet the demands of 5 billion? It seems wasteful. While Earthbag building is affordable, I don’t think it is the mass produced solution Mr. Govindarajan is imagining. In my opinion, that is okay. 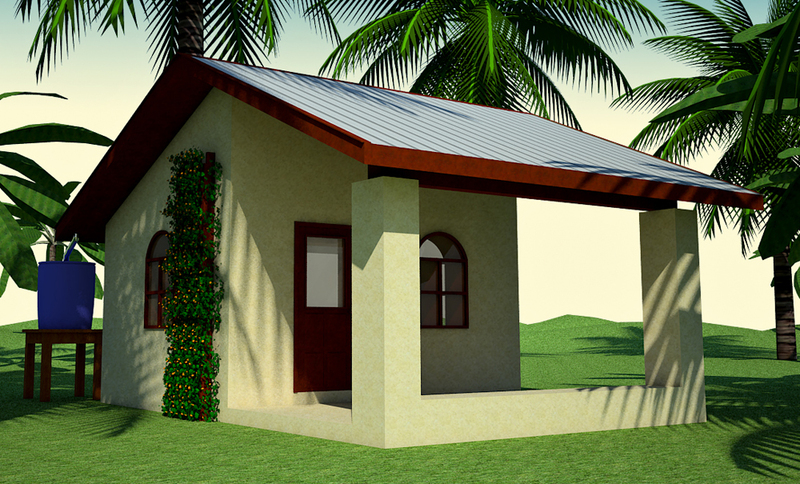 My personal belief is that educating people on how to provide their own safe, earthquake and fire resistance home is much better than giving them a mass produced shell of a house. Rather than a purchase, it is an empowering experience and they can pass the knowledge on to their community. And many aspects of your design can be salvaged. I’ve looked at quite a few of the proposed design, and so far I like yours the best. A lot of the ideas, creative and innovative as they may be, seem impractical and unlikely to meet the goals of the project. There is also a lot of wonderful ideas that may be feasible. I think bamboo is another great resource. It’s fast growing, strong for it’s weight and abundant in many areas. There are a lot of barriers that could prevent people from building their own home, or buying a mass produced $300 home (assuming they can afford it). Landlessness, building codes, local government, and that in some places (for example the U.S. and our homeless) there is no place for these people because people don’t want them around so they force them into temporary camps and slums, or into a nomadic life by police harassment. I think if progress could be made to lessen or eliminate these barriers we’d really be our way to uplifting people out of poverty. I hope the judges don’t choose projects that draw money away from communities. That would be a huge mistake, counterproductive even. They can choose projects that create jobs locally. See my $300 CEB House for one example. Earthbag building also falls in this category because the bags are recycled and more bags are continually being made for multiple purposes. Another good example is the Recycled Plastic Block House: http://recycledplasticblockhouses.com/ Not sure if they’ve entered the competition yet. This method uses low grade plastic trash that’s not otherwise resold and recycled. And as far as shutters on my design, yes, I agree. I left them off due to the extreme cost limitation. In reality, people would add shutters. Is it still impossible, governmentally, to build an earthbag house anywhere in the USA? Good question. I’d say no because if you haven an engineer’s stamp then it’s virtually impossible for building officials to stop a project. The engineer (and architect) are the experts, not the building officials. They’re the ones putting their career on the line. And now Precision Structural Engineering, Inc. is stamping earthbag plans. Taking it a step further might help explain the process. Let’s say the building officials said no for some reason and turn down a project that the engineer has provided full documentation for. Obviously they could get sued by the engineer. How would the bureaucrats defend their position against the knowledge and expertise of a professional engineer? They couldn’t. The engineer has greater skill and can prove something is safe. Aye… And I know you can’t answer this directly becasue all areas are different, but won’t a Stamp and a Permit usually cost more than the whole building project even if it is 100% DIY? For example, Florida, where it is illegal to build your own home. PSE said a typical engineering fee for a small home would be around $2,500. Add permit fees on top of that. Our 15′ interior roundhouse cost $2,100, so yeah, the cost will be higher. Earthbag house is a new thing for me . But the motivation to build one is big. I would be interested by this one called ” $300 Earthbag House ” Option A, the starter home. My place is far from electricity and drinking water network. I can get electricity with a solar panel . What about drinking water ? Do you have a solution for it ? 2 additional questions: Do you organize building workshops ? Where ? Could I already see real and built “$300 Earthbag Houses” somewhere ? Roofwater: you can capture water from the roof after it rains and from snow melt. Google “roofwater” to learn how to do this. It’s very easy. Use metal roofing and gutters to direct the water into barrels, cistern or water tank. Use a screen to keep out leaves, etc. Sometimes you can get plastic barrels for free. Just make sure they’ve never contained any hazardous chemicals. You can raise the barrels so the water flows by gravity into the home. Run the water through a water filter before drinking. No one has built this particular house before. You could be the first! The plans are free on the jovoto website. Also, I have a new video coming out very soon. Watch our Earthbag Building Blog for the announcement. The video shows and explains every step of construction. This plan is free. It was designed to help solve the homeless situation. 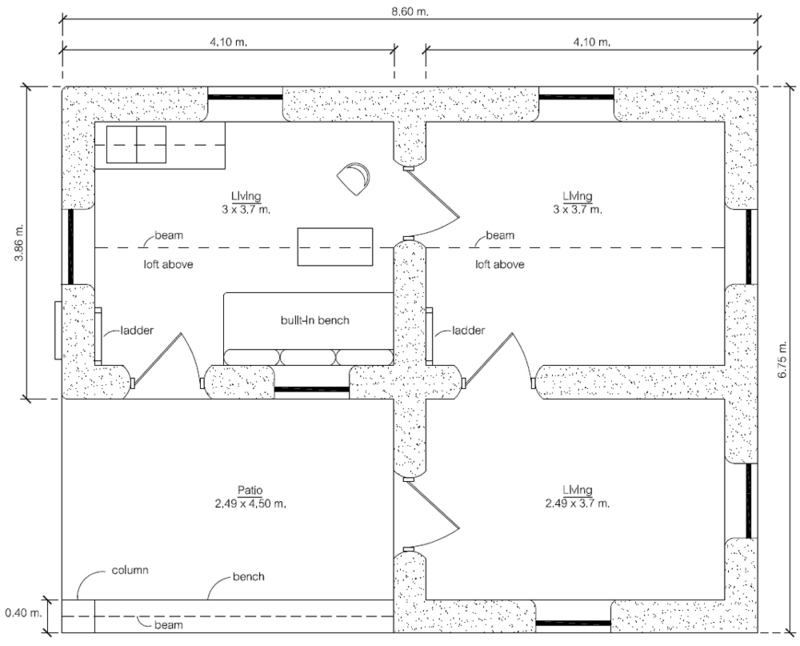 Email me at strawhouses [AT] yahoo.com for the drawings (AutoCAD or PDF). Please keep us posted of your results. Document your project with notes and lots of photos so we can share your experience with others. During the competition, I said on their website that of the many house plans, yours was one of the few I’d actually consider living in. 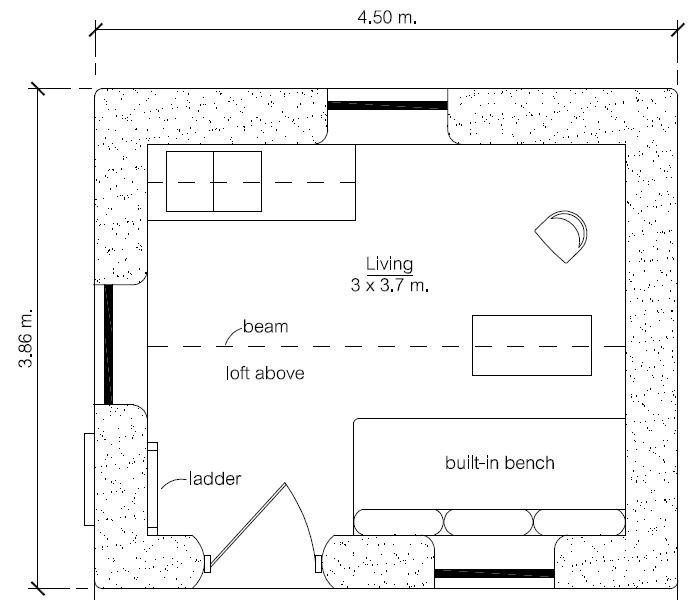 It’s been just over a year here I am typing this in my tiny house, roughly the size of this very plan. We moved to our friend’s property and converted their shed into a house a season ago. It is about a foot longer than this plan on the inside. The space that would’ve been taken up by the small kitchen is where I sew as part of my small business. We use the bathroom and kitchen in the main house but we do have a mini-fridge for snacks. We have all the important amenities of modern life. We have a computer using our big screen tv as our monitor, a Play Station 3 and an X-Box 360. We have an AC which we got for free from a friend of a friend. It’s rated for a place twice this size and keeps it very cool in our hot Sacramento summer. It was cold (for Sacramento, not for anywhere else) when we just moved in and we did fine with no heating system in place. The TV and light fixture give off some heat and at night blankets kept us plenty warm. We love living here and after all the work of downsizing from our old 1200 sq ft condo we adjusted to our 124 sq ft easier than we expected. The hardest thing to deal with, is one computer which serves as a tv, music player and gaming station but these are all just luxuries when you get down to it. I don’t miss apartment living one bit. I have room to garden. We share no walls so we can be obnoxiously loud and bother no one. I like blasting music so it’s probably the best part of living here, other than the low rent. Thanks for sharing. Like you, I’ve lived in various sized houses and over the years have come to realize just how little space one needs to be comfortable and happy. I could certainly get by just fine in the $300 House. And, if you ever need more space, it’s easy to add on. So I think this simple design is one of my most practical starter homes. Is there a way to turn this into a cabin?? I love this idea however I really would enjoy a cabin. Thank You. This would make a perfect cabin. All that’s required is to make sure the design matches the building site — climate, slope, orientation, etc. Use locally available and appropriate materials. You can learn all this from library books. Study topics such as Site Design, etc.